THE HAGUE - The president of Mexico, Enrique Peña Nieto, today strengthened commercial ties with the Netherlands in a meeting with the business community of this country, which highlighted the willingness of both partners to increase cooperation in areas such as the maritime, energy sector or agrifood. Next, the Mexican president participated in an official lunch with King Willem Alexander, who valued Mexico's initiatives in favor of human rights. "We want you to see in Mexico a reliable destination, an appropriate destination for the expansion of investments in the Netherlands, Mexico is generating jobs, we are already the sixth most visited tourist destination in the world," said Peña Nieto before the Dutch federation of workers VNO-NCW. During his official visit to Holland, Peña Nieto began the intense day today with a round table at the VNO-NCW, in The Hague, an event where the Mexican exchanged ideas with representatives of Shell, Philips, Heineken, the ING banks and Rabobank, among other Dutch companies. One of the topics most celebrated by both parties was the recent trade agreement signed between the European Union (EU) and Mexico, which modernizes the 2000 treaty, and which involves the elimination of import tariffs for many products, including agricultural products. "We are prepared to compete with our products in all global markets, in all demanding markets, and to show the quality and productive capacity that exists in our country," said Peña Nieto. The meeting also put on the table "interest" for greater economic cooperation between the two countries, focusing especially on the maritime, energy, agri-food and infrastructure sectors. 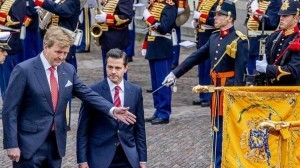 The King of Holland received Peña Nieto at the Palace of Noordeinde in The Hague and both had a meeting followed by an official lunch, in the company of the Mexican first lady, Angelica Rivera, and Queen Máxima. The Dutch monarch took advantage of his speech to demand "respect for human rights" in Mexico and welcomed the measures taken by Peña Nieto in recent years, he said, to "provide more protection" to activists and journalists. In his opinion, Peña Nieto has "worked hard to provide more protection to human rights defenders and journalists" and noted as a "good example of this" the Law of Forced Disappearances, passed last year by the Mexican Congress. However, King Willem Alexander lamented that the fight against organized crime is perhaps the biggest challenge that Mexico faces today, which implies reducing the use of weapons but also the detection and prosecution of those responsible for the violations committed. The Mexican president stressed for his part the climate of great democratic normality" in which the general elections will be held on July 1 in his country and assured that Mexico has strengthened the democratic vocation represented in the "diverse positions" in the candidates for the presidency. "The institutional strengthening we have and the balance of powers will allow us, regardless of who is the winner, to stay on a path of growth and development," he told the Dutch business community. The Dutch king also made reference to the electoral question and affirmed that he will continue with "interest" the elections because the kingdom of Holland is "neighbor of Mexico", because the Dutch islands of Saba, San Eustatius, Sint Maarten, Aruba, Curaçao and Bonaire are located in the Caribbean. "The Netherlands is ready to increase collaboration with their country whenever possible, we are already one of the largest investors in Mexico, and we share their hope that the fruits of our cooperation will benefit all Mexicans," concluded the Dutch king.